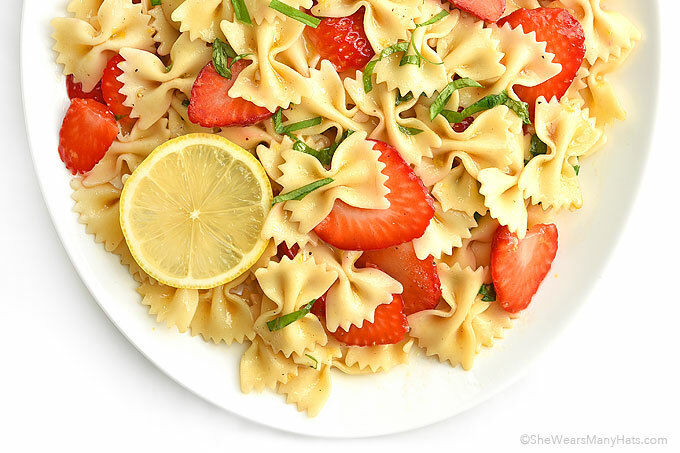 Strawberry Lemon Basil Pasta Salad is a tasty dish that will brighten up any plate. Spring has sprung and no one is happier to see a change in season. The daffodils are popping up everywhere, the forsythia couldn’t be brighter and our transplanted red buds are just gorgeous (thank you, Nanny J!) 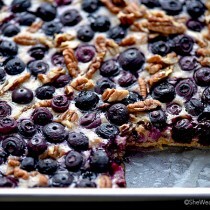 I love how the change of season is reflected on our plates too. Local asparagus, broccoli, and strawberries are signs that spring is really (and finally!) here. 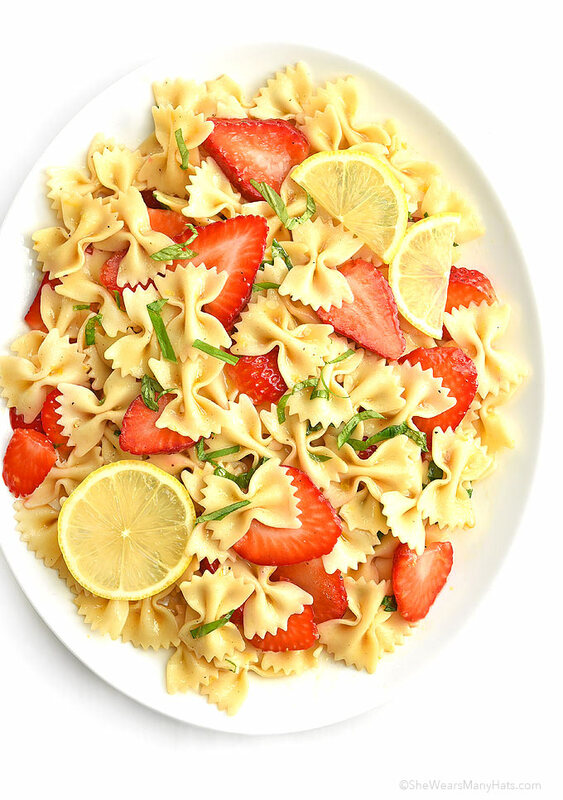 This Strawberry Lemon Basil Pasta Salad recipe is the perfect dish to perk up your plate to welcome spring. This pasta salad is super simple. The dressing can be made a day ahead and tossed with everything except the strawberries. Add those in just before serving to avoid the whole salad turning pink. Although a pink pasta salad may be perfectly what you want for a baby shower. 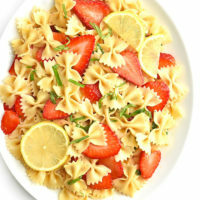 A pasta side dish made with strawberries, lemon and fresh basil that is perfect for spring and summer occasions. 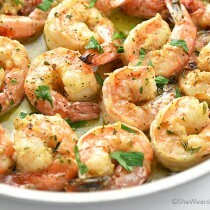 In a large bowl, whisk together oil, lemon juice, balsamic vinegar, sugar, salt and pepper until sugar is dissolved. Add pasta, basil, lemon zest and strawberries;* toss to coat. Salt and pepper to taste. Serve or refrigerate covered until ready to serve. *If making this salad ahead of time, note that the strawberries will turn the pasta pink as it sits. If concerned about the pink pasta (which can be pretty) an option is to add the strawberries just before serving. Such a gorgeous spring salad Amy. Would never have thought to put strawberries with pasta, great idea. Love the lemon slices and fresh basil! This looks so bright, fresh and delicious. 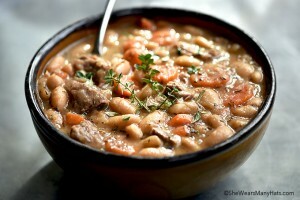 An amazing dish for spring. My name should be engraved on this Amy! First and foremost my favorite noodles; nothing is prettier but the flavors just make it shine. I’m so ready for light and luscious and this combination does it so well. I am too, Barbara! Bring on the sun! i’ve never seen anything like that? strawberries and off white pasta. beauty! i’m going to use this sometime when the strawberries are really ripe and sweet. thanks for the read. I made this today. It was yummy. I added in cubed mozzarella – I wasn’t sure about the cheese with the lemon flavor but it was surprisingly good. For anyone wondering about how fast the pasta turns pink – after sitting for an hour and a half, only a couple of edges of pasta were slightly pink. I brought the leftovers home. It’s been 9 hours and less than a third of the pasta has pink edges. Oh, a nice addition, Peggy. Thanks for sharing it. I am eating this now! It’s amazing. So happy to hear that you enjoy it as much as we do, Rachel! 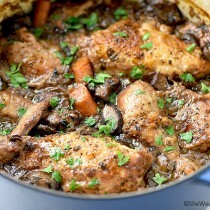 Amy, this is one of my FAVORITE recipes!! I make it a lot in the summer. I couldn’t find strawberries for awhile in the winter where I live. I was so happy to find them again (it’s January). I am making this salad to go with some grilled chicken sausages tonight!! Grilled chicken sausages sound like a wonderful partner for this pasta salad, Sandy. Great idea!